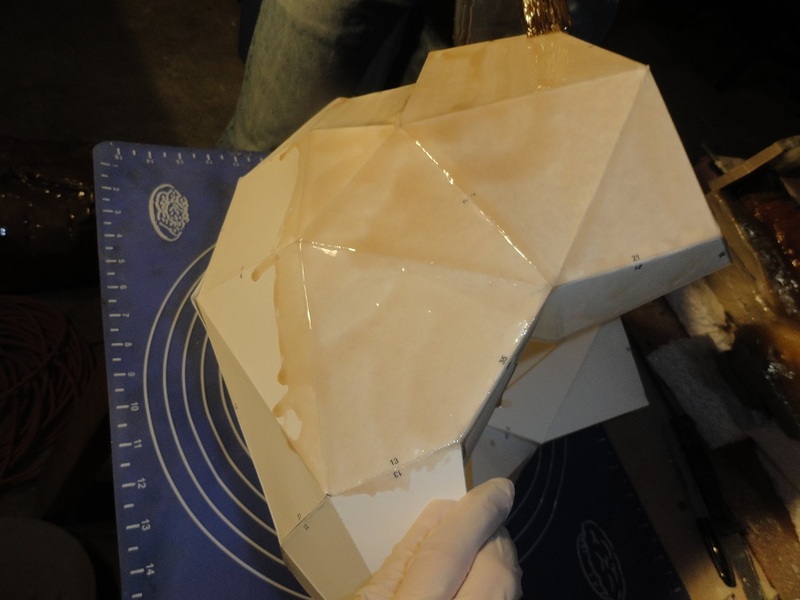 This Tutorial will help walk you through the handling, set up and mixing of fiberglass resins along with a bit on how to coat your project to get full penetration of the resin in to the paper. !! Safety First!! Always work in a well ventilated area, a garage will work but I strongly recomend a fan to help move the air around. Failure to do this will result in feeling faint, light headedness, and headaches. These are the first things that will occur when exposed to the fumes for to long. This can be prevented through the use of a properly fitted respirator. Fit Test Guide An OV/P95 is ideal for this and should be used if at all possible. These are available from most home improvement warehouses for around $20. Can’t say enough about this, most people only get two hands and if you want them to stay in a useable condition you will want to protect them from the harsh chemicals in the resin. Nitrile Gloves and Latex Gloves work great and are cheap enough to use and discard. You may change your gloves 2-3 times every 20 min while working with fiberglass to keep your hands from becoming to sticky to handle your project. Ok, now that you are safely outfitted with the proper personal protection equipment (PPE) we can start the project. 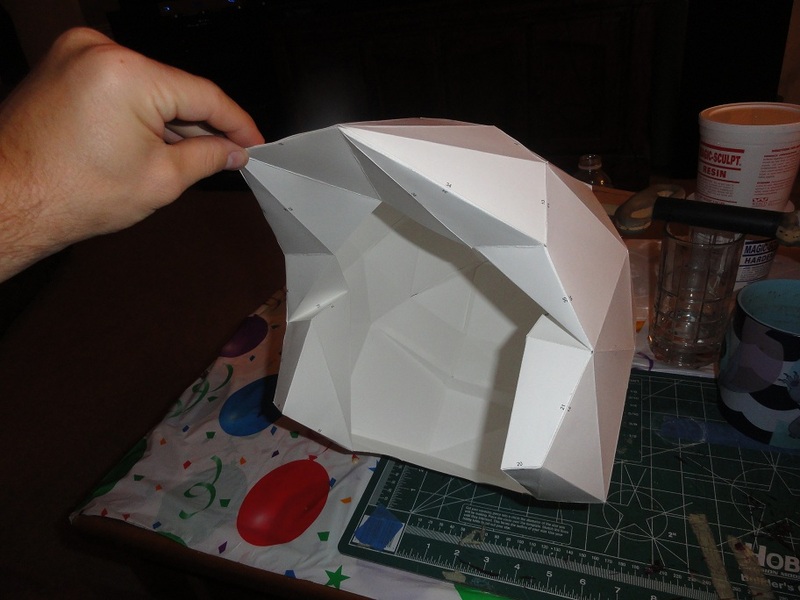 We start with a pepakura pattern printed out on cardstock. 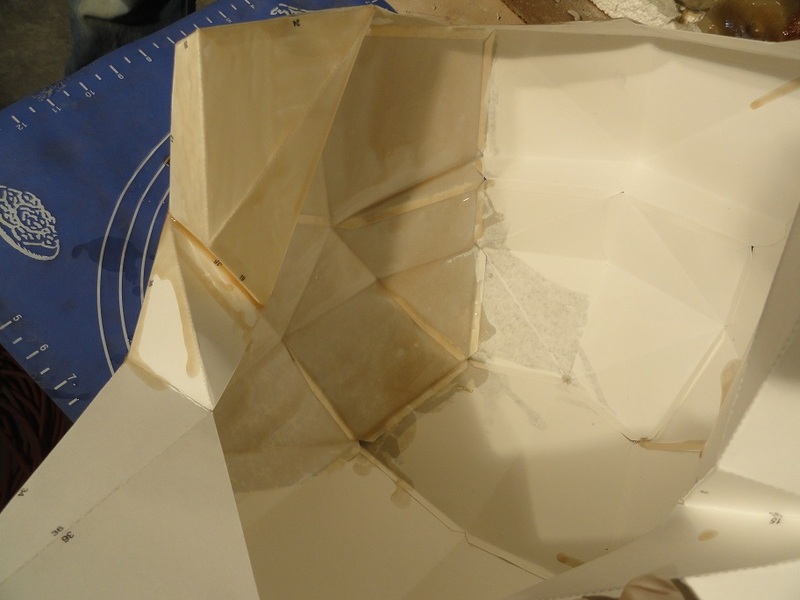 although a bit tougher to fold, this thicker paper will help absorb more of the resin when we finish the project. Work in a controlled manner and make sure each piece is connected to the right tab. If you do screw up, print off a new piece and try again. The amount of time spent getting this right will greatly improve the end project. !! Do not use tape of any sort to hold your project together!! All tapes will de-solve when the resin is applied and your item will fall apart. Hot glue works well but can be a bit thick at the joints. I have always used “gel style” superglue and it has produced great results. 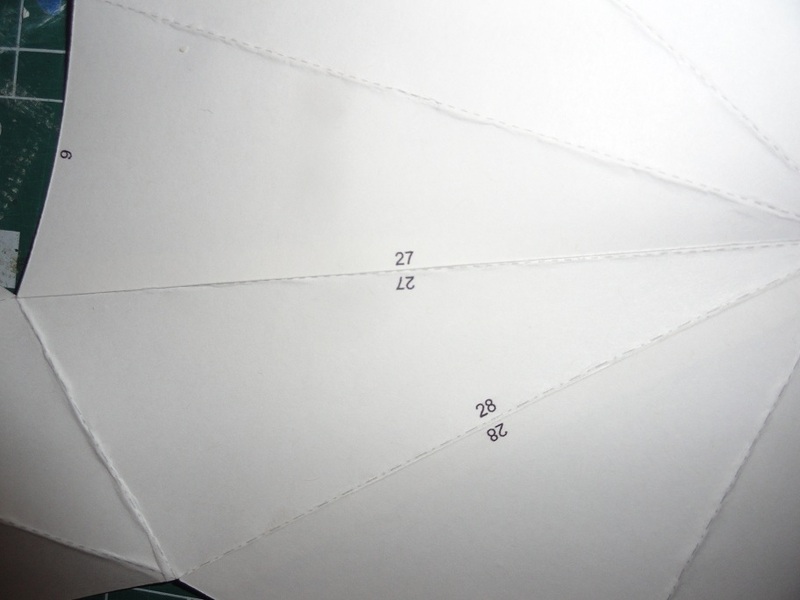 These projects are as easy as fold on the dotted line, cut on the solid line, and match the numbers up and glue. A great project for the starting cosplayer. 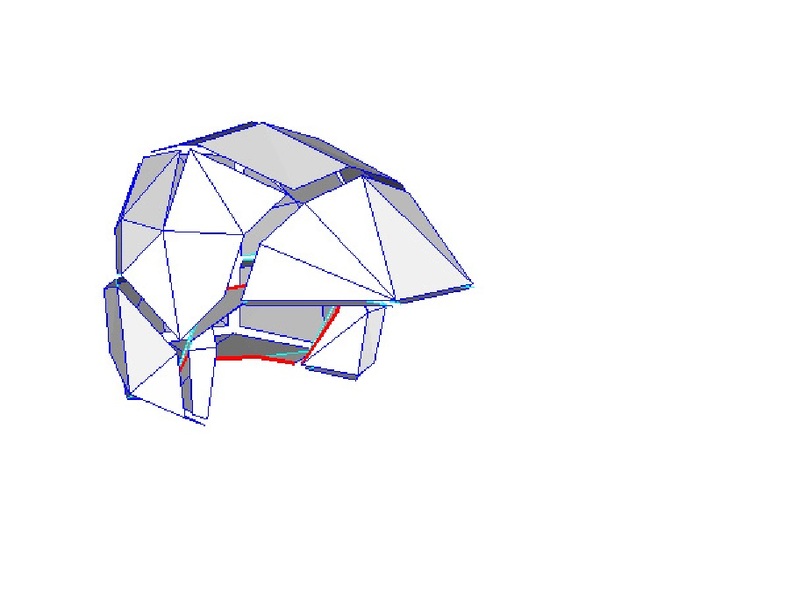 Several popular cosplays from Starwars Storm Troopers to Halo armor are avalible in Pepakura patterns. 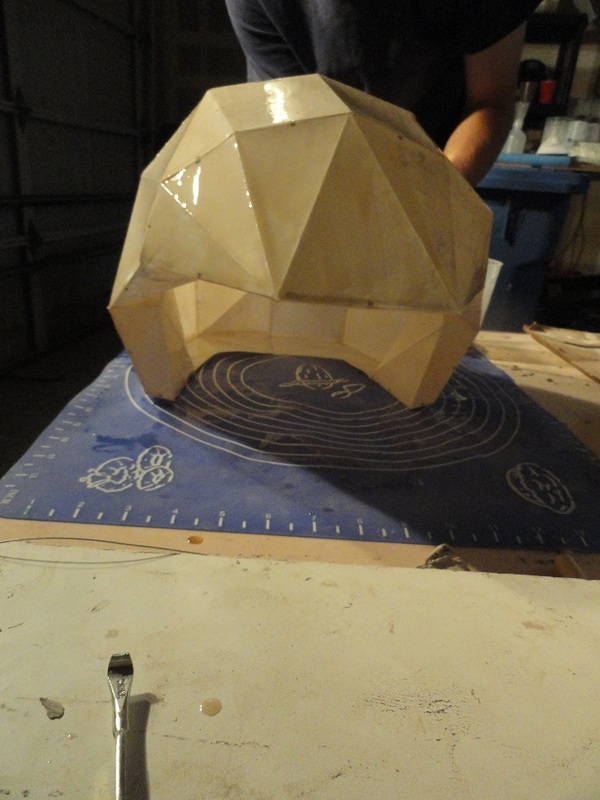 Time to head out to our well ventalated area and do some work with the resins. 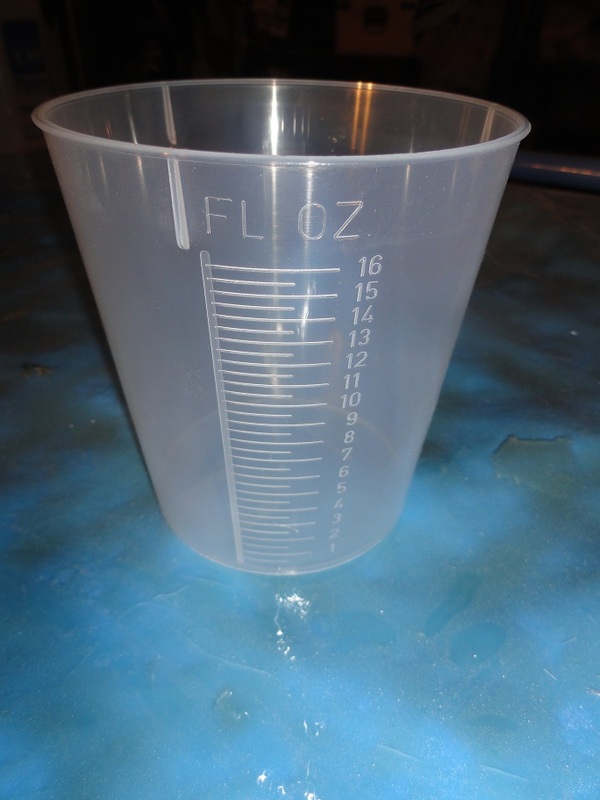 A good measuring cup is important to ensure a good mix and proper measures. 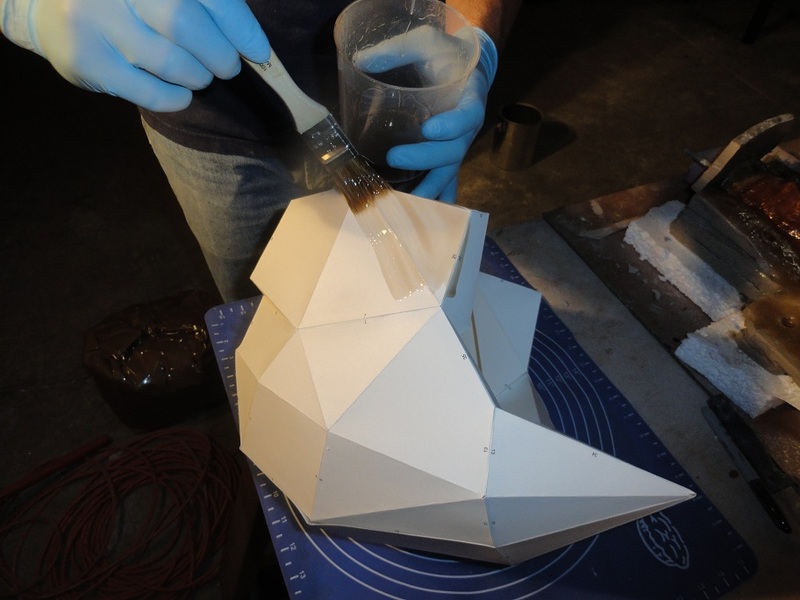 As you work more and more with the resins you begin to get a feel for how much you will need. In this case 4oz of resin will be required. 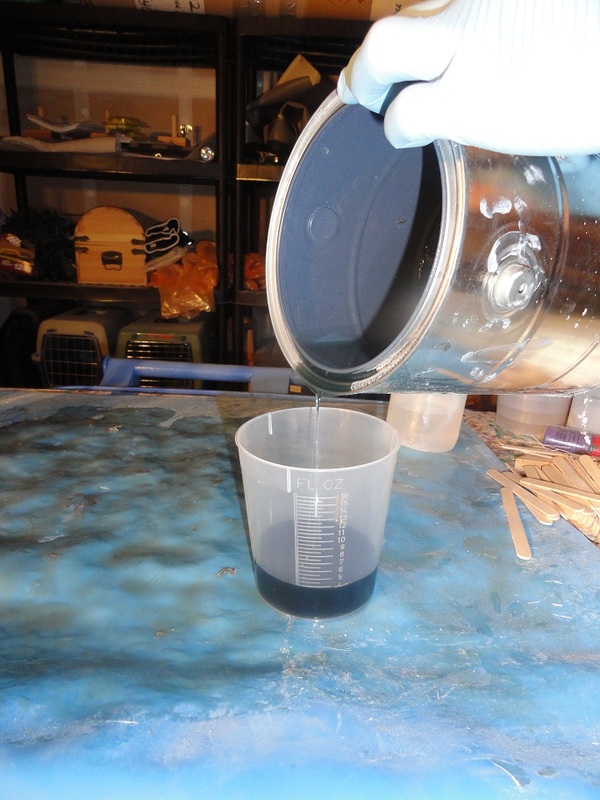 The resin used in this tutorial is a polyester resin that uses a catalyst to cause it harden. Although you technically cant add too much (there is a limit to how much can be mixed), you will want to do a few small test batches to find a good working time / cure for your area. Make sure to write down the ratio of resin to catalyst so you remember what’s best for your area. Humidity, elevation, and temperature all will effect the amount needed. A good rule of thumb is the more catalyst you add, the faster your resin will set up, and the hotter it will cure. For my house in California at about 75ft of elevation and 65 degrees, I will be using a pretty simple formula to figure out the amount of catalyst needed. This is a good starting point and can be adjusted depending on your results. 4OZ / 2 = 2CC of catalyst. Once you mix the two parts you are at a point of no return, 45 second of mixing will help ensure that you have fully intigrated the two parts and that the resin will fully cure in aprox 15-20 min. 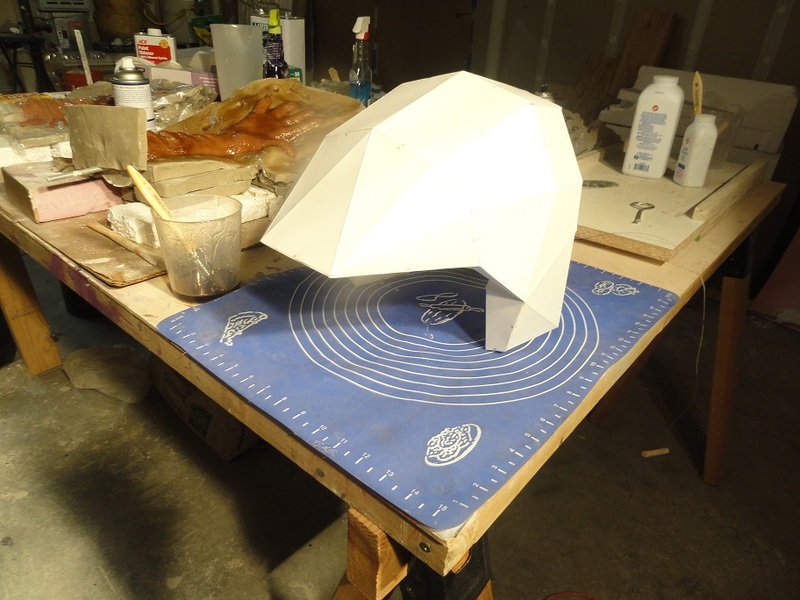 I have positioned the helmet on a silicone mat to prevent sticking to my work surface. When cured the resin peels off the mat and does no harm. 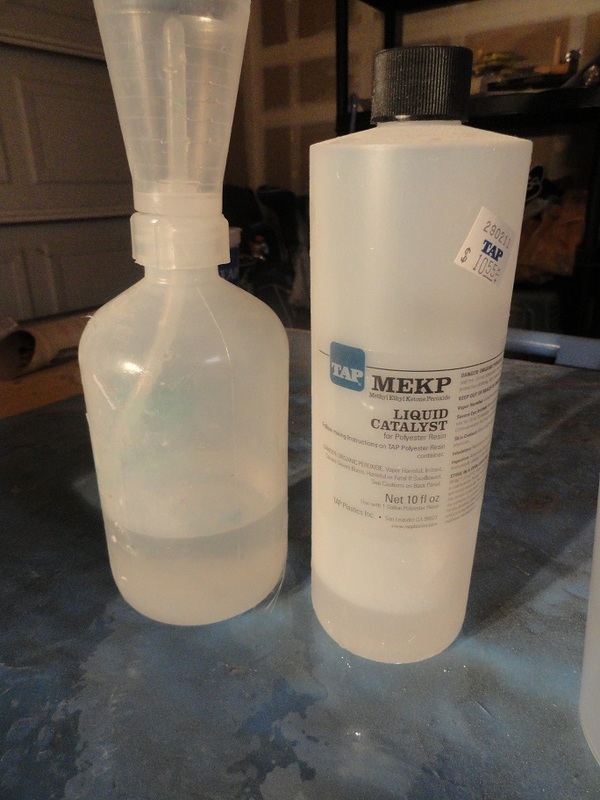 A great investment for anyone working with resins and hotglue. Libraly apply the resin over the project. You will begin to see it soak into the paper. 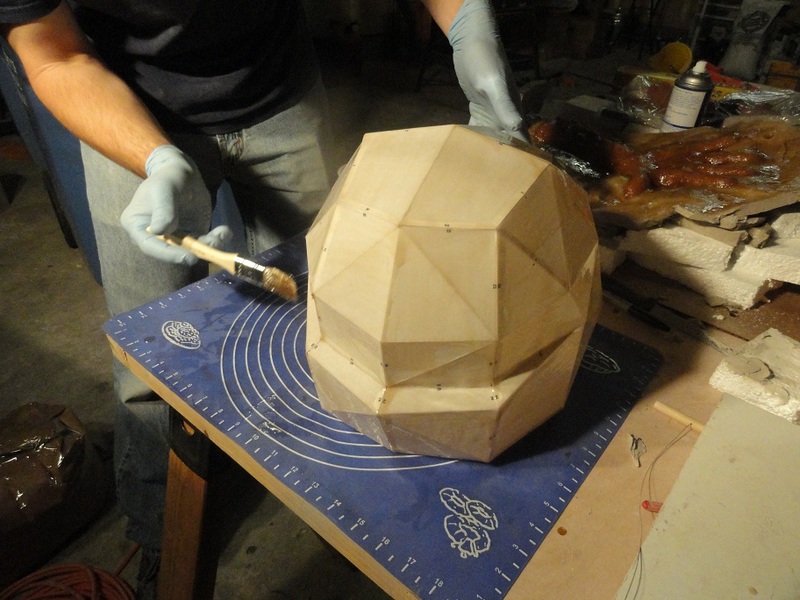 It is key that the resin fully penetrates the cardstock. 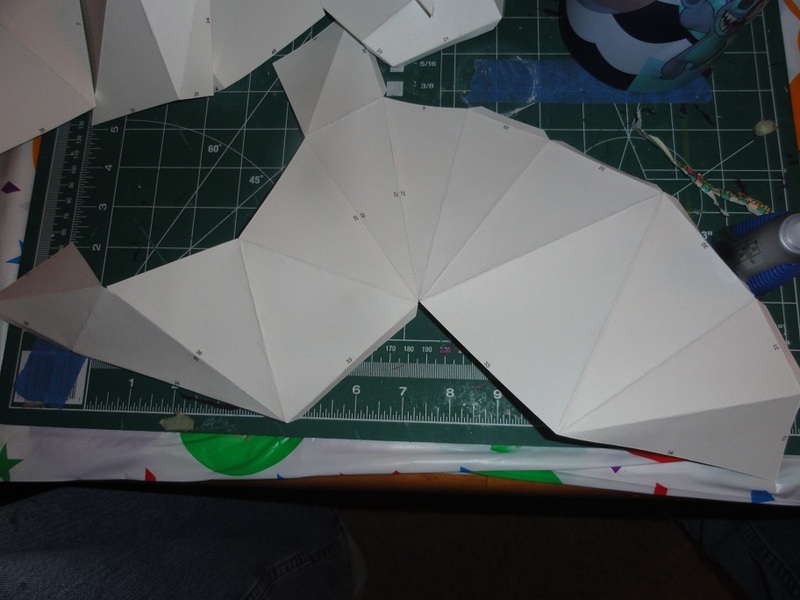 As it works into the material you will see the cardstock become slightly trasparent. it gets a “greasy napkin” look to it. Once you have fully coated the inside and out of the object and you’re happy with the coverage, you will want to position the item where ever you will let it cure at and do one last brush over the surface to help remove any runs or puddles of resin that may be on your project. Alright at this point you are done until the resin cures. It should set up and be able to be handled in about 30 min, full cure and durability won’t happen for almost 24 hours. Try to leave the item alone as long as possible to ensure the best results. I hope this helps you in your quest for awesome looking and pretty easy to create costume pieces. Don’t be scared of fiberglass resin and don’t assume its just for the “serious” cosplayers. Like all tools it needs to be understood and applied in the right situation but It is still easy enough for any one to use. I’ll make making a followup post on how to finish your helmet (paint, etc) soon. 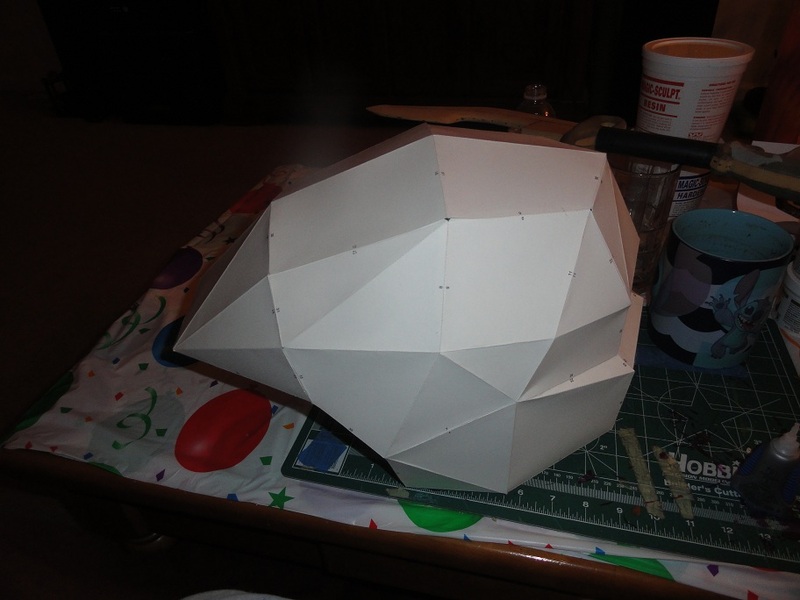 This entry was posted in Cosplay, Tutorial and tagged cosplay, fiberglass, halo armor, pepakura, resin. Bookmark the permalink. Looking forward to the finishing tutorial (as I am currently having trouble with that)! Glad to hear we could help out! Feel free to message us if you have any questions, we love to help! is it okey if I use normal A4 paper? I’m not sure, I think it depends on how big the project is. 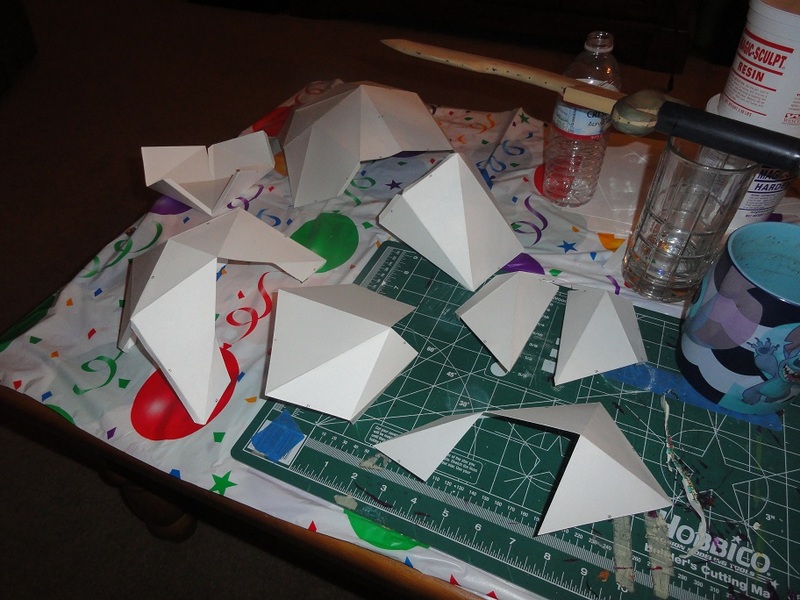 If it’s a larger project, then you definitely want to use thicker paper so that it has more sturdiness. I’ve also never tried to use resin with regular paper like that, so I’m not sure that it would be okay or not! Hi, Thanks for your tutorial, I tried this but after 12 hours, my piece is still tacky. Is it normal? Or do I have to wait for the full 24 hours? Thanks! It depends on the type of resin you used, but some can take up to 24 hours to cure completely. If it’s not cured by then, then you didn’t mix in enough catalyst, or it might be too cold or too humid for it to cure completely and may need more time. Thanks for your reply, I guess that’s the reason, it’s been 2 days already and it’s still tacky, it was a cold day when I applied the resin. I guess I have to do it all over again. You know, we haven’t tried anything other than resin, but out experience with wood glue is it can shatter if the piece flexes at all. So, it could work, but I’d use it with caution because like I said, it can easily shatter and break off if it flexes.